Timothy, my son, the saying is sure and worthy of full acceptance. For to this end we toil and suffer reproach, because we have our hope set on the living God, who is the Savior of all men, especially of those who believe. Command and teach these things. Let no one despise your youth, but set the believers an example in speech and conduct, in love, in faith, in purity. Till I come, attend to the public reading of scripture, to preaching, to teaching. Do not neglect the gift you have, which was given you by prophetic utterance when the council of elders laid their hands upon you. Practice these duties, devote yourself to them, so that all may see your progress. In the name of the Father and of the Son and of the Holy Spirit, Amen. My beloved Christians, in today's Gospel we read about something which was a common occurrence in the latter years of the life of our Lord and Saviour Jesus Christ. 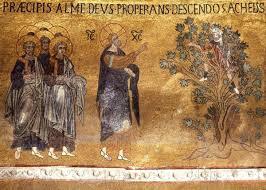 As we know, once our Lord was baptized, He no longer dwelt as He did formerly in His home in the city of Nazareth. He had embarked upon His mission to spread the Gospel of salvation to all the people in the area of Palestine. He went from town to town, wandering over all the country roads. When He came to a particular town or city, if there were God-fearing people who dwelt there who would offer Him and His disciples something to eat and a place to sleep, all well and good; if not, then our Lord, along with His disciples, would find some other place to spend the night. Our Lord often passed by the city of Jericho because it was an important and large city and was on the road between Jerusalem and Galilee, which, as we know, was the home country of our Lord and Saviour. Since our Lord went to Jerusalem many times, He often passed through Jericho; and that is just what He was doing in today's Gospel account. As always happened when He passed through a city, great crowds gathered. Some wished to hear His Divine words, some just wanted to see Him for a few seconds, and some hoped to witness miracles because wherever our Lord went, He would speak and wherever He went, He would perform miracles. And so, today in the city of Jericho, people gathered to see and hear and witness our Lord's Divine activity. One could say that practically everybody in the whole city had come out to see our Lord. It happened that in the crowd there was a certain man named Zaccheus. Now this Zaccheus was a tax collector. In fact, he was the chief tax collector for the whole city of Jericho. At that time this was a very nasty profession. The Roman Empire extracted large amounts of money and goods in the form of taxes from all its subjects. In order to do this, certain people were delegated in each city and town to be tax collectors. They did not receive a salary from the Empire, but, in return for their work, they had permission to extract their fees from the people. Thus, not only did the people have to pay taxes to the Roman Empire, but, at the same time, they also had to pay a fee to the tax collector for the job he did of taking their money and goods! That was the bureaucracy of the Roman Empire. As might be expected, in such a loosely organized system, there was much room for abuse. When the tax collector collected the taxes for the Empire that he sent to Rome, he also extracted what he considered to be his fee. More often than not, he exaggerated this fee in order to enrich himself. As we know, such a policy would not work on the politically strong or on the wealthy because one cannot take advantage of people who have influence. Therefore, the tax collector always took advantage of the paupers and the peasants, the widows and the orphans, the shopkeepers and the tradesmen - all the people who were unable to fight back. He exploited them and because of this exploitation, he would be the most hated man in town. Such a man was Zaccheus and, according to the Gospel, he was not just a simple tax collector. He was, in fact, the chief collector. This meant that he must have been quite infamous for all the injustices he had committed against those who could not defend themselves. Yet, what do we see, but this man who was despised by practically the whole community coming out with everyone else to see our Lord and Saviour. Who knows what was going on in his heart. Maybe he had reached a point in his life where all of a sudden he had become tired of exploiting people, tired of taking advantage of them, tired of listening to poor women cry as he took their money or food. Because this was what he had done. He went into people's homes and took their flour, oil, or whatever else they had. Many times he literally took food out of the mouths of children who were fatherless. Perhaps all the images and memories of these injustices which Zaccheus had enacted over a long period of time had finally come to torment him and to torture him. Perhaps he was looking for some relief, some way to expiate his sins, some way to be free of this horrible burden which had had brought upon himself and, looking for this, he went to see our Lord and Saviour Jesus Christ. The Scriptures tell us that Zaccheus was a short fellow and because of his small stature, he was not able to see over the heads of all the people in front of him. He had come out just to see Christ and his heart and soul really, really desired to see the Lord Whom he was hoping would provide a solution to his problems and thus give relief to his tortured conscience. Being a clever fellow, he climbed up into a tree so he could get a better view of our Lord. So it happened that as our Saviour passed through Jericho, He stopped under that very tree where Zaccheus was sitting. As we know, our Saviour is not merely a simple teacher; nor is He just a Prophet. He is none other than our God and, as our God Who created us, He alone knows what is to be found in our hearts. As our God and as our Saviour, He knew that at that moment there was this man, Zaccheus, up in a tree. He knew exactly what was in Zaccheus' heart and so He stopped and, looking up at Zaccheus, He said to him, "Come down from this tree, for today I am going to dine with you at your house so go home and get ready." Zaccheus, (it is a miracle that the poor man did not fall out of the tree! ), climbed down and immediately and with great joy rushed to his house, hardly daring to believe the gracious words he had just heard. Unfortunately, there were many who, upon hearing our Saviour's words to Zaccheus, were not happy. They judged and criticized, saying among themselves, "What business does He have going to the home of such a sinner!" These people were scandalized and offended that our Lord picked the house of such a horrible man in which to have supper and spend the night. Not only were they judging Zaccheus for his sins, but they were also passing judgement on our Lord. Nevertheless, our Lord went to the house of Zaccheus and after supper Zaccheus confessed all of his sins. So moved was Zaccheus, that not only did he repent of his evil ways in word, but he also wanted to express his repentance in deed. He promised to give one-half of all his fortune to the poor and from the leftover half, he promised to restore four times over what he had taken unjustly from everyone. So great was the repentance of Zaccheus! So great was his joy over the fact that our Lord and Saviour would enter into his home bringing salvation to him personally and to all who dwelt there. We have nothing else recorded of the conversation between Zaccheus and our Lord. We can only guess how the Saviour must have spoken to him with such tenderness and kindness and how He must have embraced Zaccheus as a Father would embrace a long lost son. We do see the repentance of Zaccheus and we know that he became a disciple of our Saviour. We rejoice that he found his salvation and that he was liberated from this great sin which he had been accumulating all those years. We see from this Gospel that there is no person, no matter how great his sin, who cannot find salvation. God, being our Creator and our Father, loves us to such an extent that there is absolutely nothing we can do that can make God not love us! Our actions make God sorrowful and they hurt Him. He longs for and waits for the day when we his children will come to our senses and realize what we have done and turn to him. God is with us at all times. He is everywhere present, knocking constantly on the door of our hearts waiting for us to open our hearts; but as mighty as God is, even as Creator of this world and of the whole universe, He cannot force us to love Him anymore than we can take a pistol and put it to someone's head and say, "Love me". Love cannot be forced. No matter what God does to us, we cannot be forced to love Him. He gave us this freedom. He gave us this divine ability to love and it is we who must make that final turning. We must turn around and face Christ and not keep our backs to Him constantly. Christ is right next to us, but what do we do? We turn our backs on Him and we look in the other direction. Instead of gazing upon the beautiful face of our Lord and Saviour Jesus Christ, we are too busy looking at other things. Instead of hearing the soft and beautiful words of our Lord calling to us, we are too busy listening to the noise and the torment and the turmoil of this world. Instead of following Christ on the road set out for us in the Gospels, we are too busy running helter-skelter in all directions, following different paths and different roads. To face our Lord and Saviour, we only have to turn around and we will see that He truly is in front of us. The divine Maximos, who was from Constantinople, sprang from an illustrious family. He was a lover of wisdom and an eminent theologian. At first, he was the chief private secretary of the Emperor Heraclios and his grandson Constans.However, when the Monothelite heresy became predominant in the royal court, out of hatred for this error the Saint departed for the Monastery at Chrysopolis (Scutari), of which he later became the abbot. When Constans tried to constrain him either to accept the Monothelite teaching, or to stop speaking and writing against it neither of which the Saint accepted to do his tongue was uprooted and his right hand was cut off, and he was sent into exile, where he reposed in 662 AD. At the time only he and his few disciples were Orthodox in the East. Guide of Orthodoxy, teacher of piety and holiness, luminary of the world, God inspired adornment of monastics, O wise Maximus, by thy teachings thou hast enlightened all, O harp of the Spirit. Intercede with Christ God that our souls be saved. Let us the faithful praise with fitting hymns that lover of the Holy Trinity, great Maximos, who clearly taught the divinely given Faith, that we should give glory to Christ our God, Who, though but one hypostasis, has in very truth two natures, wills, and energies. Let us cry to him, “Rejoice, divine herald of the Faith”. The Martyr Neophytos, who was from Nicea in Bithynia, was the son of pious parents, Theodore and Florence. Led by grace from his childhood, he took up his dwelling in a cave upon Mount Olympus at the age of nine and lived there in asceticism and prayer. At the age of fifteen, during the reign of Diocletian about the year 290, he presented himself to the local Governor named Decius. Roused to fury by his unexpected boldness, Decius had him scourged, then laid out on a bed of fire. When he had been preserved by grace through these torments, he gave him up to wild beasts. But since the Saint remained unharmed, a certain pagan fell on him with a sword and slew him. Thou didst shine forth from the mount like unto lightning and didst glorify Christ God in thy martyric pains and death, O thou Great Martyr Neophytos. Wherefore, thou hast now received the unfading crown.